Situated on a huge lot, in the heart of Downtown Durango, the Wild Horse Guesthouse is only five blocks from the Durango & Silverton Train Station. This two bedroom one bath house is uber comfy. Full of light, and decorated in what we call Modern Cowboy style. All the luxuries of a boutique hotel await: claw foot tub, tile shower, new memory foam beds, fine linens, and an American Leather Comfort Sleeper couch in the living room. There is a king sized bed in the master bedroom, and a queen in the second bedroom. Then the Queen Sleeper couch and a nice full sized futon in the living room. Four beds total. The kitchen is complete with real knives, gas range, full sized refrigerator, island, and all the dishes and pans you could want. Open floor plan lends itself to family gatherings. There is A/C in the summer and a beautiful gas fire place in the winter. The front yard is fully landscaped with a nice cool lawn to play on and a covered porch with furnishings. 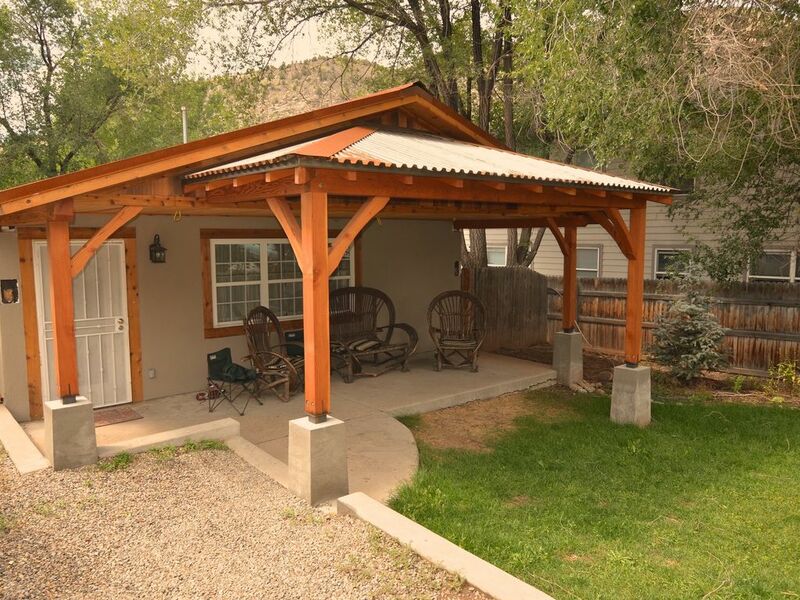 The porch is new and with post and beam construction under a rusty metal roof is is super stylish. Being on the north side of the house in the summer it is a great place to eat al fresco. The back yard is huge and surrounded by a privacy fence. There is even a doggy door to the side yard that leads to the back yard. Woof. Location is where it is at: half a block from the River Walk trail to Santa Rita Park, a short walk to Durango Natural Foods Co-Op our great local grocery, Horse Gulch Trail System, the Train Station, coffee and breakfast places, and of corse all the downtown restaurants and shops just a short walk away. The Wild Horse Guesthouse, a beautiful place for your family to explore Durango. Sun Mesa House: 1 Bed 1 Bath 9 miles south of Durango. My husband Ben and I started doing Vacation Rentals so that I can stay home with our son Luca who is now 2 years old. I have a business degree from Fort Lewis College and have lived here in Durango for over 18 years. With a professional background in Design, I have had a ton of fun decorating the guesthouses in my own Modern Cowboy style. Clean and Beautiful. That is how I like it. With Claw-foot Tub and a tile shower the bathroom is very comfortable. Two sources of heat: Gas Fireplace and additional Radiant Electric Heat in the bathroom and bedrooms. Plenty of dishes for a family of 6. With large island for entertaining and cooking. This is a fancy 3-D Flat Screen super hi-fi hi-def BoobToob! With a video selection of 3-D movies. Nice Tivoli Stereo in the kitchen that can do Blue Tooth or plug into a device like your phone. Front yard is irrigated and landscaped with a small lawn and perennial beds. Two old mountain bikes are provided in the shed in the back yard. Helmets are also provided so please use them as our trails are rocky! The front porch is beautiful. On the north side so it is cool in the summer. We have willow furniture with cushions. This house is very kid and pet friendly. It is located just a few blocks from the Train and Downtown Durango. The yard is huge and private. Its well appointed and has everything your family will need to be comfortable after long days of adventure in Durango! Fantastic stay! We found nothing lacking. Location was ideal for our activities, including a nearby park that our 6yr old son loved! Comfy beds and well equipped kitchen. We've stayed in many VRBOs over the last decade, and this was one of the best! We plan to visit again. Thank you for allowing us the use of your home. This was my first stay using VRBO and was unsure of what I should expect. You anticipated the needs of your guest's needs and likes without a great deal of precision: kitchen, bathroom, bedrooms, children ... you nailed it! The kids dived right into the costumes. I think it took them about 30 seconds in the home to find those. Super cool! I certainly enjoyed the bathtub and was able to soak after a day of skiing. It is our hope to book with you again next year around the same time, thank you! We loved this little house! It's in a quiet neighborhood and very close to downtown shopping and restaurants. The house is adorable and had everything we needed. Nice, comfortable house. Beds were great, as comfortable as any 4 - 5 Star Hotel. Close to town and pet friendly. Only issue was spotty wi-fi. Great location, charming and comfortable! Great, we’ll kept place. Super cozy, well appointed. Everything you need and more! Wonderful place. Absolutely fantastic stay. Thumbs up!!!! Only five blocks to the Train Station. One block from the River Trail that leads to Santa Rita Park and the River. Seven blocks to our Local Food Co-Op Grocery store. Easy walk to tons of great restaurants and shops. This house is on the last street in town so there is not a lot of traffic. Rates are subject to change until the reservation is confirmed. Holidays may be priced differently then listed, please inquire.